Many homeowners today are starting to see the value of decorating their outdoors. Landscaping has become an important part of this. Adding a garden to your property and a few planters can definitely revamp your landscape. But instead of using the average planters for this, you can choose to use creative decorative wheelbarrow planter designs that deliver style and functionality at the same time. You can make your own decorative wheelbarrow planters from scratch. However, it’s advised to buy readymade planters too. Before you decide to buy a decorative wheelbarrow planter you may want to consider a few important factors. First, the style is very important. The wheelbarrow is not just supposed to be a space for planting. It’s supposed to also play a part in revamping your landscape. Going for a boring average style will not work. You need to pick something more stylish and unique. Antique wheelbarrow designs custom made just for you should really do. The size matters too. You need to pick a wheelbarrow planter that’s not too big to clutter your yard or too small to fit a good number of plants. Finally, consider the type of material. Traditional wheelbarrows are metallic. But you will also find wooden designs custom made for your garden. Metallic designs offer more durability. Wood, on the other hand, has its charm and can be easily customized to deliver the perfect results. In case you live in a place with tough weather, you may consider metal. The rule of thumb is to make the wheelbarrow as colorful as possible. It’s likely that the planters will be set on a background of lush green. Bright colors will really blend well with such a background. You can add your own creative touches too to make your wheelbarrow more appealing. For instance, try to play around with the wheel. Old vintage style wheels are highly recommended. Don’t overcrowd the wheelbarrow. You want it to be visible in order to get the best results. Mix up the plants on the wheelbarrow too. Brightly colored flowering plants should do the magic. In case you are in the market for a custom-made decorative wheelbarrow planter, we have a few product suggestions that might just work for your landscape. The Leigh Country Char-log Pine Wheelbarrow Planter is a classic and sophisticated design that can be used to grow several delicate plants. The wheelbarrow is rectangular in shape and it’s made from high-quality pine. The warm brown finish will easily complement any landscape including your garden. It also has a vintage style wheel on the front to add to its class. This simple wheelbarrow planter is also 100% wood. Its rustic design with a vintage style wheel makes it perfect for your backyard. For the perfect results, try to use two wheelbarrows, one small and the other large. The Play and Hearth Wood Wheelbarrow Planter is ideal in an urban setting where you may be limited in terms of space. If you are thinking of creating the perfect decorative focal point for your landscape and revamping your outdoor living experience, this is the wheelbarrow to go for. The wheelbarrow can be used for two distinct functions. You can use it as a planter or as a shelf for other smaller planters. Either way, it will deliver outstanding beauty on your property. The Fir Wheelbarrow Planter is simply a bundle of charm. You can use it for different kinds of plants. The antique looking fir wood cart is complimented with an antique style metal wheel. The dark brown finish is also spectacular. The wheelbarrow is big enough to accommodate many plants. This design is relatively unconventional from normal wheelbarrows. First, it has two large wheels. It’s a flower garden wagon with a meshed base and an open wooden frame. The wheelbarrow is quite stylish and it’s the perfect addition to any outdoor setting. The Oakland Living Cedar Wheelbarrow Planter is also taller compared to many other wheelbarrows. This makes it a stand out object in any landscape, patio, or garden. The Goat Steel Wheelbarrow Planter is also another unique design that features a steel goat and a small steel wheelbarrow cart. Think of it as a horse pulling a cart only that this time the goat is the horse and the wheelbarrow is the cart. The steel can be painted in various colors too. This Wood Wheelbarrow Planter is an aged design that really takes you back centuries. The design is quite basic but very unique too. The wheelbarrow also features two chambers that can be used as planters. It also has two ceremonial wheels. Although you can decorate the wheelbarrow the way you want, its unique rugged finish is always ideal. This Steel Wheelbarrow Planter is designed with class in mind. It’s not really your traditional wheelbarrow but it still has two basic wheels and a house like structure. The wheelbarrow is ideally used as a vase to hold outdoor flowers and not necessarily as a planter. However, it’s still magical regardless of how you use it. 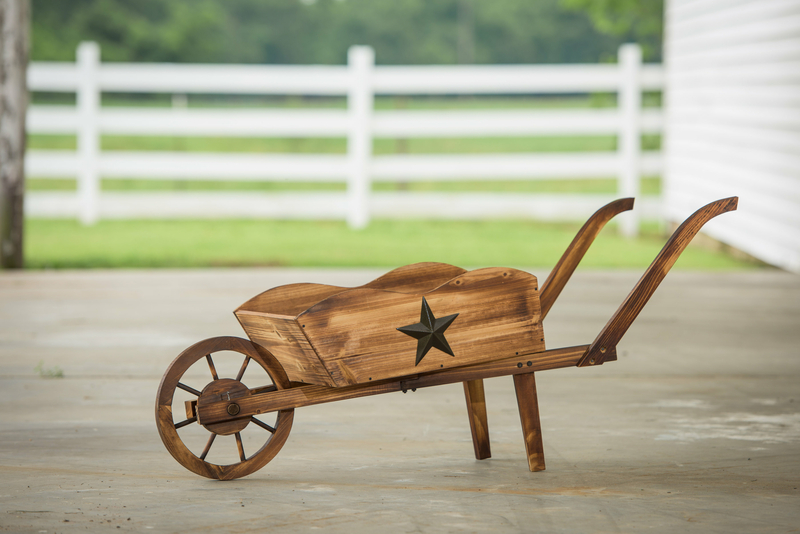 The Besancon Rustic Metal Wheelbarrow planter features a wagon shaped design with a unique faucet handle. The silver finish with four silver wheels make it one of the most unique planters in this list. The planter is also oval shaped and is ideally used for flowers and other brightly colored plants. The Shanda Metal Wheelbarrow Planter with Trellis is also another creative vintage style design that resembles a bicycle. The design features two plant pots, one on the back and the other on the front. Its large sized front wheel with detailed finishing is also a key feature. You can use the back wheel planter to grow plants with the front wheel option being used as a vase.